Objective: Jan Aushadhi (People's Medicine) Stores (JAS) are still struggling to get well established in India. Although the Jan Aushadhi (JA) scheme was launched in 2008, the number of JAS has not increased much until now. Therefore, we aimed to determine the working and productivity of JAS in the country. Methodology: We conducted a web-based survey of current JAS owners using a validated questionnaire. The questionnaire was sent to the E-mail addresses as mentioned on JA website. We solicited the information about the aspects such as background information, working and productivity of the store, hurdles while running a JAS, and the opinions. Results: One hundred and sixty-nine individuals responded to the survey out of 1008 (response rate = 16.76%). One hundred and forty-three (84.62%) JAS owners have reported the net monthly profit to be Rs. <5000/-. They have also reported that there are certain hurdles while running the shop. Other important average values for certain parameters were follows: patients approaching a JAS/day – 47.43, net profit/month – Rs. 4230.85, and prescriptions filled/day – 27.06. Conclusion: Dealing with generic drugs is a multifaceted and complex issue in India. JAS were not as “economically productive” as to a regular “government”/community pharmacy in India. There are some flaws as far as the functioning JAS is considered. Although JA scheme was launched long back, it has not spread well in the country until now. Productive inputs are essential for better running of the scheme. The government should think of the hurdles and the suggestions as reported by the JAS owners. Generic medicines are one of the hot topics of discussions and deliberations in India nowadays because of their lower prices. According to the United States Food and Drug Administration, “A generic drug is identical or bioequivalent to a brand name drug in dosage form, safety, strength, route of administration, quality, performance characteristics and intended use.” Generic drugs have been known to minimize the health-care costs. According to Cameron et al. study, generic drugs may reduce the costs for an individual country in the range 9%–89%. Many governments in the world are encouraging the use of generic drugs. In this regard, the “Jan Aushadhi (People's Medicine) Scheme” (JAS) was launched by the Government of India in 2008 to make low priced quality medicines available for the people through dedicated stores. However, by March 2017, there are only 1008 JAS available in the country, which are definitely not enough to meet the medicine – demands of the whole country. Therefore, it is important to know whether the current JAS are working well or not and whether the shop owners have any hurdle while running the shop. Further to add, it is suggested in Vaidya study that JAS should be assessed for functioning for time to time. When we referred the literature, we could not find any article on this subject, and hence, we aimed to assess the working and productivity of JAS in the nation. We aimed to determine the functioning and productivity of JAS in the country by considering various parameters. We also aimed to assess the perspectives of the JAS owners about the scheme. First, we obtained approval from institutional review board to conduct the study. This was a web-based (online), prospective, cross-sectional study determining the working and productivity of JAS in India. All JAS owners in the country were considered to be eligible for the survey. Generic medicines are purchased by the “patients” and dispensed by the “pharmacists.” Therefore, an exploratory interview was conducted with four patients and six pharmacy shop owners to find the possible sections and items in the questionnaire. The questions were framed as per the sections – background of the owner, working and productivity of JAS, owner's perspectives, and hurdles while running a JAS. Perspectives of the owner – hurdles to run the shop, recommendations, personal efforts taken to promote generic drugs, and recommendable to friends or not. Validation of the draft questionnaire was conducted by expert opinions and pilot testing. After development, the questionnaire was sent to three experts and they were asked to critically review the questionnaire for content, flow, grammar, etc. After this, the questionnaire was tested on pilot basis with six pharmacy shop owners to find ease of responding, range of options, and the specificity to obtain the responses. The recommendations provided by the experts and the responders in pilot testing were considered for improving and finalizing the questionnaire. The data acquired by pilot testing were not considered in the final results. This web-based survey was conducted using “Google forms.” The validated questionnaire was sent to the E-mail addresses (which are in public domain) of JAS owner as mentioned on JA website  at least twice (including a reminder). If an owner has got more than 1 JAS, he was asked to submit the survey form separately for each shop. The background information, objectives, and other details of the study were mentioned in the form. The informed consents were obtained from all the responders. Identity of each responder was kept anonymous. The study was conducted for 14 months. Convenience sampling was used. The results were analyzed using Microsoft Excel. Raosoft calculator  was used to determine the margin of error. Suppose for calculation of net profit earned/month, we determined the median of all the options. Then, we multiplied the median by number of the responses for the option to calculate cost for the option. Then, we summed all costs for each option to determine total cost for the question. Afterward, we divided the total cost by total number of responses, i.e., 169. While surveying the JAS owners, we did not ask upper limits for certain options of the questions. For example, for monthly import of the store, we asked the last option as >3 lakh rupees. For calculation sake, we took the upper limit for this as Rs. 4 lakh. The upper limits for other productivity-related questions were as shown in [Table 2]. There are 1008 JAS currently exist in India. Out of them 624 email addresses were available from JA website; out of which 169 responses were received. Hence the total response rate (out of 1008 shops) was 16.76% while the same out of 624 email addresses was 27.08%. We received the responses from 20 states/union territories. The proportion of bounce E-mails was 7.37% (i.e. 46/624 X100). The margin of the error for the sample size 169 was 7.51%. Other results and average values for certain parameters of the survey were as explained in [Table 1]. Although the total respondents were 169, we received >169 responses for the questions related to hurdles and opinions because we allowed the respondent to select multiple options (checkbox type of questions). The “other” responses for question number 14, 15, and 16 are as mentioned in [Table 3]. It is difficult to survive with low income for many retailers, especially unemployed pharmacists. According to literature we searched, very few studies have been conducted on JA drugs. Janodia study  and Nallani study  (on JA-Jeevandhara scheme in AP) have compared the prices of antidiabetic drugs in market with JA drugs, and they found substantial differences in the prices, i.e., JA drugs were much cheaper. Further to add, few laboratory studies have suggested that JA drugs are of equal quality to that of branded ones. Singhal et al. compared the quality of four JA drugs (alprazolam, cetirizine, ciprofloxacin, and fluoxetine) with the respective brands. JA drugs passed the relevant pharmacopoeial tests in the study, depicting that they are of good quality as that of the branded once. Similarly, Singh et al. also found that JA drug (metformin) has equivalent and comparable quality to that of branded one. According to Tank et al. study, ceftazidime in JA scheme demonstrated no difference in in vitro antimicrobial activity to that of the branded drug. To the best of our knowledge, ours was the first survey that was conducted to assess the functioning and productivity of JAS in the country. The survey results may help know the exact status of the JAS in terms of functioning and productivity and may also provide important guidelines for policy-makers and future researchers. For many states, the ratio of “number of E-mail addresses” to “the number of JAS mentioned on the website” was less. Only few states, for example, Kerala had the ratio near to 1. Possibly because of this, we received the highest number of responses (n = 32, 18.93%) from Kerala. Among the category of the JAS, more than half of the owners were individual entrepreneurs (nonpharmacists). It reflects that unemployed pharmacists are not opting much to open a JAS. 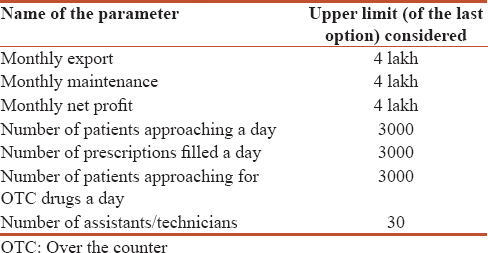 The probable reasons for a pharmacist “not” to opt for opening a JAS are assumed to be (the proportions in our study are mentioned in the bracket) – fewer varieties of the drugs (18.31%), less physicians prescribing generic/JA drugs (15.78%), less margin (i.e., 20% in JAS vs. 200%–1000% for branded drugs , (13.26%), less patients approaching to the shop (4.51%) as compared to a regular community pharmacy in India, less prices of the drugs (because less prices of the drugs indirectly cause less profit generation as compared to a regular community pharmacist), etc. All these reasons have already been reflected in our study. Majority of the JAS (n = 108, 63.91%) in our survey were 1–6 months old. We could have got different results from the same owners at another point of time because JAS still in the budding in the nation. Although the average values calculated were not “arithmetic means,” the values are still useful for determination of the current status of JAS. A retail pharmacist in India earns Rs. 198,134/year (i.e., 16,511.16/month) on an average. The average net profit earned by an owner in this study was Rs. 4230.85/month which is nearly one-fourth of a retail pharmacist. On an average, 47.43 of patients approach to a JAS/day which we think is far less for a “government pharmacy.” Because for information, nearly 10,000 patients approach to the Outpatient Department of All India Institute of Medical Sciences everyday. Majority of the JAS owners (n = 42, 24.85%) in our survey have reported that the ratio of prescription to nonprescription drugs was 10%:90%. The possible reason for higher dispensing of nonprescription drugs may be unavailability of many other drugs/combinations. For all categories of JAS, the owner can appoint the manager (i.e., pharmacist) and other employees in a JAS. We found that there are 1.63% of assistants/technicians working in a JAS on an average. Looking at the published evidences, Vaidya study  has stated poor supply of the drugs as one of the major reasons behind failure of the JA scheme. Furthermore, it was in the news recently that a JAS in Dehradun was facing shortage of the drugs. In our study too, the poor supply was one of the major hurdles reported. Sufficient and regular supply of the drugs was one of the important recommendations which further strengthens the fact that there is improper supply of the drugs. Prescribing generic drugs is not a common practice in India may be because of less/no profit sharing or poor awareness in public and/or physicians. Prescribing in government hospitals is also by brand name. Likewise, in our study, 15.78% (n = 119) of people responded that private practitioners do not send the patients to their JAS. Some (selected) studies reporting less generic prescriptions are (the percentage of drugs prescribed by generic names is mentioned in brackets) – Shamna and Karthikeyan(0%), Sen and Bathini(4.83%), Shelat and Kumbar(6.67%), Satpathy et al. (11%), and Mahajan et al. (15%). The Medical Council of India as recently updated the regulation (for Professional Conduct, Etiquette and Ethics, 2002) that every physician should prescribe the drugs with “generic names.” On the similar grounds, in this study, 14.51% (n = 103) of responders have reported that there should be a rule to prescribe generic medicines. Rawat et al. have recently evaluated the knowledge and self-practice of pharmacists and prescribers regarding the use of generic drugs. According to the study, in preworkshop, nearly half of the pharmacists and the physicians were unaware about JA scheme of the government. Probably because of unawareness, 14.23% (n = 101) of responders have reported that physicians should be educated about JA drugs in our study. The Chronic Disease Assistance Program has been launched in Trinidad and Tobago to provide free prescription drugs for certain chronic diseases. The program has caused phenomenal increase in the sale of generic drugs and decreased the sale of brands. JAS have fewer drugs on chronic diseases such as diabetes, hypertension, asthma, cancer, and cholesterol problems and that need to be focused. The same has been suggested by many responders in our study as mentioned in [Table 3]. Thawani et al. conducted a study in which they provided knowledge about rational medicine use, purchase, and stocking behavior to the patients and measured its impact. The following things improved after their intervention – awareness about price variation, self-medication, expiry period, generic and brand quality, attitudes toward new, costly, brands, injections, sharing and reusing old prescriptions, stocking habits, adherence to doctors' advice, getting cash memo, comparing prices, reading labels, etc., Such awareness programs are needed that can improve the patients' drug literacy since insufficient public awareness about JA drugs has been reported by many responders (n = 129, 18.17%) in our study. Recommendations are regarded as one of the vital measures to find whether or not, a particular service or business is successful. We solicited whether the owner will recommend to start a JAS to his friend/colleague to determine the same, and 81.66% (n = 138) of owners reported that they will recommend to start a JAS to their friend/colleague. In fact, we feel that the positive recommendation is little contradictory because 84.62% of owners have reported that their net monthly income is Rs. <5,000/- (which is far less than a regular community pharmacy in India). We observed that every JAS mentioned on the website had not provided the E-mail address to contact them. Hence, we could not approach such owners. We also found that E-mail addresses for some shops were repeating. The reason behind this might be multiple shops opened by the same owner. The study may not provide the exact national status of all JAS in the country because of the less sample size. Furthermore, we could collect data from only 169 JAS that too in 14-month period. The reason behind this was slow increase in the number of JAS. We could not conduct any statistical analysis of the study. We obtained the responses directly from a JAS owner, but we have not crosschecked the data with official records. We suspect the reason for some overvalued responses (e.g. net monthly benefit as 30 to 50 thousand rupees by 2 respondents etc.) as reporting about the 'multiple' shops owned by the 'same' individual. We contacted the JAS owner only by E-mail and not by any other means such as phone call, whatsapp, etc. Using other means could have increased the response rate of the study. Bureau of Pharma PSU of India provides one-time financial assistance of Rs. 2.50 lakhs to open a JAS. However, we did not consider the incentives separately for determination of costs for import, export, or maintenance. Comparison of cost of purchasing of branded, generic and JA drugs would have given clearer insights in the study. However, we could not do the same. We could have retained the “practical adjustments for calculations” [as mentioned in [Table 2] as ranges directly. However, we could not do so. We could not find any standard methodology for calculating the averages. The averages calculated were logical; they were not arithmetic means. Since the averages were determined by calculating the medians and number of responses, we suspect that the averages are little higher/lower than the real ones. For example, if an owner responds that <20 patients approach to his shop every day, the median for 0 and 20 would be 10; no matter if the patients are 0 or 20. According to us, the root cause of the all the problems about generic drugs and JAS is associated with improper marketing and governance. The government needs to take initiative to solve the issues. As per Mukherjee study, not all prices are lower than the branded medicines in JAS. For example, cefuroxime axetil brands are cheaper than their JAS counterparts. The same has been reported by 1 of our responders in the survey. For this, the government should review the prices of all the JA drugs. Coming to another issue, JAS are closing down mostly because of state governments' policies. For instance, health policy of Rajasthan, Haryana and Tamil Nadu provides free medicines from government hospitals. 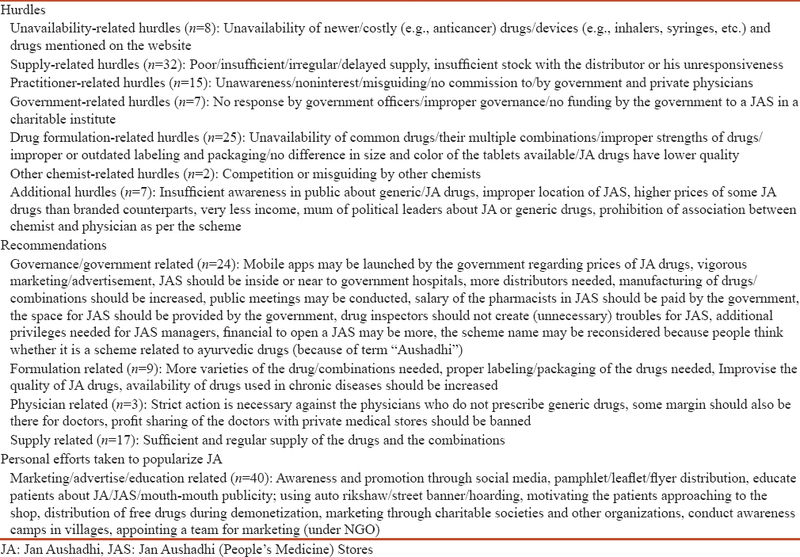 Other reasons for nonfunctioning of JAS are nonprescription of the JA drugs by government and private doctors, less availability of all medicines, overdependence on support (from state government), deprived supply chain management, lack of awareness, etc. We came across many of these reasons in our study. Various hurdles have been reported by the owners to run a JAS. Top 2 hurdles were supply related (n = 32) and formulation related (n = 25) [Table 3]. The government should try to solve every single hurdle and needs to have a firm policy for this. The JAS are not enough at the moment to meet the needs of India as a whole. The number of JAS must be more and more since JA drugs are highly economic. To solve this, current medical stores in all the government hospitals (in the whole nation) may be converted to JAS. It may bring uniformity among the JAS. Current pharmacy students do not have official exposure to JAS. Opening a JAS in the premises of every pharmacy institute in the country may provide a professional training and exposure to them. Both these things, converting medical stores in the government hospitals and opening JAS in premises of a pharmacy institute, may help increasing the number and the business of JAS. Moreover, the Pharmacy Council of India is trying to open 600 JAS in pharmacy colleges. Strict implementation of the MCI regulation for prescribing generic medicines should be assured. It is written in the guidelines (for an individual) to open a JAS that “The applicant is not allowed to offer for sale any other products, services, or business from the JAS.” However, as mentioned in the literature, pharmaceutical care should be provided at JAS. Pharmaceutical care broadly involves identification of drug-related problems in the prescription, medication counseling, and individualization of the therapy. We advise the government to reconsider this point in the guidelines. JA medicines are probably the cheapest drugs (as per maximum retail prices) among all the available brands in the nation and have good quality as that of the branded drugs. Both these aspects are highly beneficial for the patients. Hence, JAS should greatly be encouraged in India. At the same time, there are certain serious issues that cannot be ignored and need to be solved for better patient care and more efficient running of JAS. If all these issues are solved, we predict that JAS may grab the Indian drug market. Issues related to JAS owners (as compared to regular community pharmacies) – less profit, less/no profit sharing, less prices of the drugs, less patient load, delayed supply of the drugs, less variety of the drugs and strengths available, less prescriptions being sent to JAS by practitioners (both in government and private set up), poor awareness in people about JAS or generic medicines, less margin, etc. Issues related to physicians – less physicians (even in government hospitals) recommend use of JA or generic drugs, poor awareness about the drugs, lack of training programs about generic drugs, etc. Issues related to pharmacy students – less exposure to JAS during pharmacy courses/student life. We are thankful to all Jan Aushadhi Store owners who responded to the survey. What Are Generic Drugs? U.S. Food and Drug Administration. Available from: http://www.fda.gov/Drugs/ResourcesForYou/Consumers/BuyingUsingMedicineSafely/UnderstandingGenericDrugs/ucm144456.htm. [Last accessed on 2016 Jul 20]. Cameron A, Mantel-Teeuwisse AK, Leufkens HG, Laing RO. Switching from originator brand medicines to generic equivalents in selected developing countries: How much could be saved? Value Health 2012;15:664-73. Jan Aushadhi: A Compaign to Ensure Access to Medicines for all. Available from: http://www.janaushadhi.gov.in/data/4FoldBrochure.pdf. [Last accessed on 2016 Jul 20]. Locate Jan Aushadhi Stores. Jan Aushadhi. Available from: http://www.janaushadhi.gov.in/jan_aushadhi_stores.html. [Last accessed on 2017 Mar 10]. Vaidya R. Evaluation of Jan Aushadhi stores concept and suggestions for bettermedicines accessibility in India. Raghavendra Inst Pharm Educ Res Poison Drug Inf Center 2013;4:10-6. Available from: https://www.ispor.org/regional_chapters/India-Andhra-Pradesh/documents/RIPER-PDIC-Bulletin-Nov-Dec-2013.pdf. [Last accessed on 2016 Sep 16]. Rasoft. Sample Size Calculator. Available from: http://www.raosoft.com/samplesize.html. [Last accessed on 2017 Mar 31]. Janodia M. Differences in price of medicines available from pharmaceutical companies and “Jan Aushadhi” stores. Value Health 2015;18:A850. Nallani VR. Cost analysis study of oral anti-diabetic drugs available in Indian govt. generic (Jan Aushadhi, Jeevandhara) drugs and brand drugs market in rural/urban area of Guntur, Andhrapradesh, India. Value Health 2015;18:A717. Singhal GL, Kotwani A, Nanda A. Jan Aushadhi stores in India and quality of medicines therein. Int J Pharm Pharm Sci 2011;3:204-7. Singh B, Nanda A, Budhwar V, Marwaha RK. A comparative evaluation of the quality & price of generic medicine with their branded counterparts. PharmaTutor 2016;4;43-9. Tank ND, Bhansali NB, Karelin BN.In vitro comparison of generic and branded formulations of ceftazidime using standardstrain of pseudomonas. NJIRM 2016;7:31-6. Singal GL, Nanda A, Kotwani A. A comparative evaluation of price and quality of some branded versus branded-generic medicines of the same manufacturer in India. Indian J Pharmacol 2011;43:131-6. Lalwani H, Kotkar S. Study of Incentives being Provided by Medical Companies to Retailers. Mumbai: IIT Mumbai; 2011. Retail Pharmacist Salary. PayScale. Available from: http://www.payscale.com/research/IN/Job=Retail_Pharmacist/Salary. [Last accessed on 2017 Mar 25]. With Over 10,000 OPD Patients, Many Die Waiting at Crowded AIIMS by AshniDhaor. Hindustan Times. Delhi. Available from: http://www.hindustantimes.com/delhi-news/with-over-10-000-opd-patients-many-die-waiting-at-crowded-aiims/story-uIOPzEwsBRNEgvxQrumqoJ.html. Nd. [Last accessed on 2017 Sep 02; Last updated on 2015 Jul 09, 16:17 pm]. Guidelines for Opening of Jan Aushadhi Store for Different Category. Jan Aushadhi Scheme. Available from: http://www.janaushadhi.gov.in/Guidelines.html. [Last accessed on 2017 Mar 25]. Jan Aushadhi Store at Doon Medical College Faces Shortage of Drugs. Tribune News Service. The Tribune. Available from: http://www.tribuneindia.com/news/uttarakhand/community/jan-aushadhi-store-at-doon-medical-college-faces-shortage-of-drugs/273101.html. [Last accessed on 2016 Sep 16]. Shamna M, Karthikeyan M. Prescription pattern of antidiabetic drugs in the outpatient departments of hospitals in Malappuram district, Kerala. J Basic Clin Physiol Pharmacol 2011;22:141-3. Sen S, Bathini P. Auditing analgesic use in post-operative setting in a teaching hospital. J Clin Diagn Res 2015;9:FC01-4. Shelat PR, Kumbar SK. Analysis of out door patients' prescriptions according to World Health Organization (WHO) prescribing indicators among private hospitals in Western India. J Clin Diagn Res 2015;9:FC01-4. Satpathy SV, Datta S, Upreti B. Utilization study of antidiabetic agents in a teaching hospital of Sikkim and adherence to current standard treatment guidelines. J Pharm Bioallied Sci 2016;8:223-8. Mahajan R, Singh N, Singh J, Dixit A, Jain A, Gupta A, et al. Assessment of awareness among clinicians about concepts in undergraduate pharmacology curriculum: A Novel cross-sectional study. J Young Pharm 2010;2:301-5. Indian Medical Council (Professional Conduct, Etiquette and Ethics) Regulations; 2002. Available from: http://www.mciindia.org/Rules-and-Regulation/Ethics%20Regulations-2002.pdf. [Last accessed on 2017 Feb 15]. Rawat R, Ganachari MS, Salimath G. Knowledge and self-practice of pharmacists andprescribers towards the uses of generic drugs incommunity settings in Belagavi, Karnataka, India. Indian J Pharm Pract 2016;9:219-24. CDAP Overview. Ministry of Health. Government of the Republic of Trinidad and Tobago. Available from: http://www.health.gov.tt/sitepages/default.aspx?id=132. [Last accessed on 2016 Sep 16]. Maharaj S, Roopnarine K, Maharaj V, Maraj S, Sankar E, Singh M, et al. Impact of chronic disease assistance program on the retail pharmacy sector: A retrospective study. J Pharmacol Pharmacother 2011;2:244-7. Thawani VR, Gharpure KJ, Sontakke SD. Impact of medicine-related information on medicine purchase and use by literate consumers. Indian J Pharmacol 2014;46:420-4. Mukherjee K. A cost analysis of the Jan Aushadhi scheme in India. Int J Health Policy Manag 2017;6:253-6. Half of the Jan Aushadi Generic Drug Stores of the Government are not Functioning by Dubbudu R. Factly. Published on 17 June, 2015. Available from: https://factly.in/half-of-the-jan-aushadhi-generic-drug-stores-of-the-government-are-not-functioning/. [Last accessed on 2017 Mar 02]. PCI Working with Ministry of C&F to Open 600 Jan Aushadhi Stores in Pharmacy Colleges. Pharmacy & Trade. Available from: http://www.pharmabiz.com/NewsDetails.aspx?aid=96774 &sid=1. [Last accessed on 2016 Sep 20]. Opening of New Jan Aushadhi Store (JAS). For – Unemployed Pharmacists, Individual Entrepreneurs, Doctors, Registered Medical Practitioners. Available from: http://www.janaushadhi.gov.in/data/Guidelines%20&%20Aggrement%20for%20Individuals%20Dec_2015.pdf. [Last accessed on 2016 Sep 16].